I’ve been designing logos for websites for quite some time now. I started years ago designing logos for friends who had stores on Ebay, and just needed a quick graphic to show on their ebay store. Over the years I’ve moved on to other projects including header logos, twitter backgrounds, entrecard logos, gravatars, ebook covers and anything else you can think of. One of the more challenging things I’ve done is design header logos for WordPress Templates. The problem is that often the templates are not setup in an easy to understand manner, and there is no real way to know what size the logos should be, how it will fit into the template, and a variety of other issues relating to how the logo will look once inserted. They’re just not user friendly. Recently I started getting requests to design logos for people who are using the Thesis WordPress Template. Thesis is one of the more popular themes in use today, and after helping design logos for several people using the template, I found out why. It is one of the most flexible, and easy to use templates available. accessibility: your ability to reach different audiences—those with special needs, people using alternative Web browsers, mobile users, etc. So the Thesis theme is flexible, easy to use -even for novice users, has good SEO so you’ll be showing up in search results, and on top of all that they have a top notch support forum where you can find answers to just about any question you might have. I had a problem with one client’s logo getting inserted into the template. I did a quick search of their support forums and had my answer within a minute or two. Piece of cake! 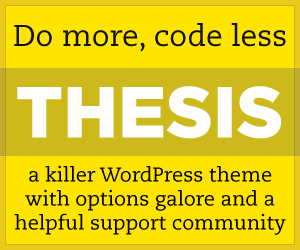 So if you want an awesome theme that’s guaranteed to give your website the fresh look you need and an easy to use back end, check out Thesis. You won’t regret it! 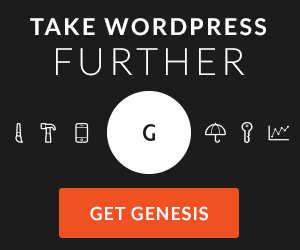 In WordPress? Your’e having a laugh right? A very simple CSS mod is more often than not all ANY wordpress theme needs to fit ANY size header graphic (or logo if you prefer that term) And if you don’t want to mod the CSS – all you need is a pixel measurement tool (there’s plenty of great free ones – like PIXUS for Adobe Air for instance) and then save the logo with the same name as the original. Not hard at all. I like the service your offering as a whole, but where it kinda falls apart is: Someone buys a background, a header graphic etc – then they have to get it all to fit into the framework. Again, not difficult if you actually know your way around wordpress …. I’m talking about for the average user who doesn’t know CSS and doesn’t have or know how to use a pixel meaurement tool. They just want to upload a header graphic into their theme without having to understand how it gets there.